Chilean environmentalists are fighting to stop the deadly dams to be constructed in the Andean glaciers to the Pacific Ocean through green valleys and fjords, while the Ethiopian dictator is preparing to build a deadly dam that will endanger million of lives of the riparian nations. The Pacified Ethiopian are forced to endorese the Death dam which will be the instrument to sell their fertile lands. In contrary to Ethiopia Chile is a nation with its energy-intensive mining industry clamoring for more power and living standards improving, while Ethiopia is damming its rivers for the land Grabbers not even the local energy consumption. This $7-billion project to dam two of the world’s wildest rivers for electricity has won environmental approval Monday from a Chilean government commission despite a groundswell of opposition while the Ethiopian dictatorial regime is not even take any measure to seek any environmental tests. It was hidden as project X by the Ethiopian Dictator. The Chili and political appointees in the democratically elected President Sebastian Pinero’s government – concluded a three-year environmental review by approving five dams on the Baker and Pascua rivers in Aysen, a mostly road less region of remote southern Patagonia where rainfall is nearly constant and rivers plunge which will definitively destroy the last remaining wonders of the Earth. The Chilean dams all together could generate 2.75 gig watts, nearly a third of central Chile’s current capacity, within 12 years while the megalomaniac Ethiopian Nile Death dam is suppose to produce Upon completion, will have an electric generation capacity of 6,000MW, three times more than the combined capacity of all Ethiopia’s existing dams. When we go back to Chile the dams would drown 14,000 acres (5,700 hectares), require carving clear-cuts through forests, and eliminate whitewater rapids and waterfalls that attract ecotourism. Aysen region, while the Ethiopian gigantic dam will cover two time the Lake Tana which is from 3,000 to 3,500 km² according to the rainy seasons. In Chile the Dam would destroy habitat for the endangered Southern Huemul deer: Fewer than 1,000 of the diminutive animals, while in the Nile Valley of Ethiopia an estimated Number of Flora and Fauna will be lost forever to come. 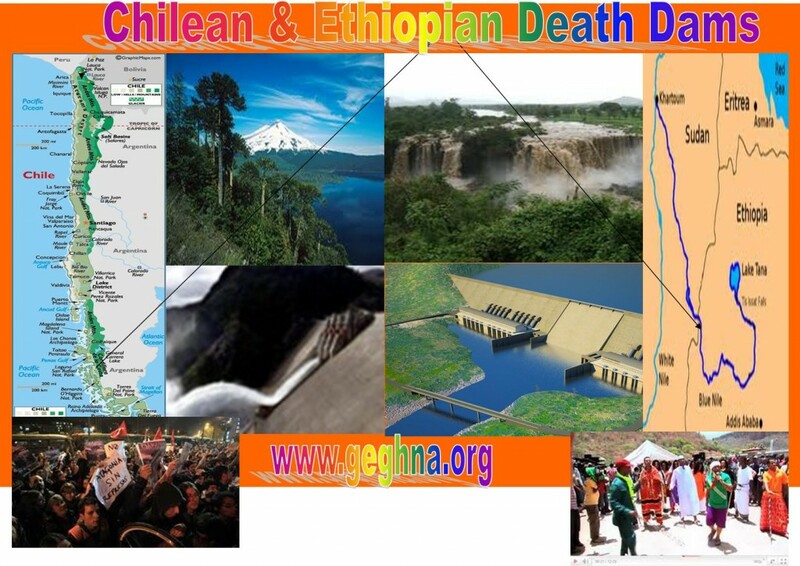 In the contrary to the Chilean the Ethiopian dam will endanger the Lives of the people in Nile basin countries. The Investors have spent Chile over $220 million on the project so far, but opposition has grown to 61 per cent of Chileans according to the latest Ipsos Public Affairs poll, and the government is concerned about a backlash. The Ethiopians even do not have a true democracy like that of Chile and are forced to accept whatever the Dictator dictates which Chile experienced a despotic regimes of the General in her recent past. The Ethiopian the dam is contracted by Italian company Salini Costruttori for €3,350bln ($4,916bln). The Dam will be the biggest hydroelectric plants ever built in Africa, producing 5250 MW. Apart from forced contributions by Ethiopian institutions and citizens, there are serious suspicions that the Ethiopian Government will not be able to fund the work. “The provenience of most funding for this and other Ethiopian Dams is utterly unclear,” declared an ex-officer of the Italian Cooperation in Ethiopia who refused to be credited. Chile is the world’s largest copper producer and e recently approved Latin America’s largest coal-fired plant, to power a mine near the northern deserts. Two other coal plants received the okay on Friday. Thus its power grid has recently been under increased strain compared to the Ethiopian embryonic mining industry, where the dam is destined just for the land grabbers. Again the Chilean government is not selling its fertile land for land Grabbers while Ethiopia has already sold most of its cultivable land to the foreign investors at the same time over 3 million Ethiopian are starving of death. In contrary to the Ethiopian death Dam which will end killing millions, the Chilean HidroAysen is suppose to help Chile to receive the cheapest, cleanest electricity possible? Though Several Chilean energy experts also dismissed solar as uncompetitive and years away from relevancy, a huge US$2.2 billion, 2.6 gigawatt solar project being built in the Mojave desert with private money and US government guarantees The latter will be the best example to the Ethiopians to learn from rather than building a destructive death dam and create undue conflict with the neighboring countries. Great dam are highly environmental risks and catastrophic with moving tectonic regions and earth quake prone countries like Ethiopia and Chile. Westerners that had build greet dams in the past have proved highly risky to the surrounding population as seen in China and the Us in recent years with the increasing floods and earth quakes.